At the start of every year we fill out a form for every conceivable situation: photo permission. PR release. Lab safety rules. Waiver of school-issued insurance. Lunch forms. Bus forms. Tech forms. Sports forms. Fund raising forms. Don’t-Make-Fun-of-the-Cafeteria-Lady’s-Mole Forms. Forms, forms, and more forms. This is the carbon-based version of Apple’s “I have read and agreed to the terms and conditions.” Nah, I neither read ’em or agreed to ’em, but there are only a few shopping days left until Christmas, I’ve blazed through six ink pens, and the kid that I was filling out these forms on behalf of? They apparently graduated by the time I made it through the stack. Enough already. 1. We asked for way too much. Name. Address. Date of birth. Email. Phone number. Work number. Spouse name. Kids’ names. Occupation. Who invited you? I’ve seen cards at other churches that asked for the “church of membership” for both the mother and father of the guest. Why that information is relevant, I have no idea. Meanwhile, by the time a guest finishes filling out the card, phoning mom for the info, and producing a certified copy of his W-2 form, church is over and the rapture is nigh. 2. We duplicated our efforts. Imagine how maddening it is to a parent to show up to church for the first time, fill out a card at the welcome center, then be escorted to the kids’ area where you have to – you guessed it – reproduce the exact same information. It’s almost as if the left hand doesn’t know what the right hand has already filled out. One of our campus leaders exposed the fallacy of problem number one above. They went rogue, designed their own info card, and asked for less information. Like, way less. Instead of a full address, they just asked for a zip code. Kids info wasn’t required unless they were planning on utilizing Summit Kids. They were actually getting more consistent information on cards that asked for less info, so we took their rogue and made it the routine. And speaking of duplicated kids info, we were able to solve that problem as well. Now when a first time family fills out the card at the tent, a volunteer takes the family and the card to Summit Kids. The info is already on the back, so a kids volunteer hands over a temporary security tag and offers to set up a profile for them in the system. But the days of duplicated info at stations just 30 feet apart? Those days are over, my friend. You can see a copy of our card here (front || back). 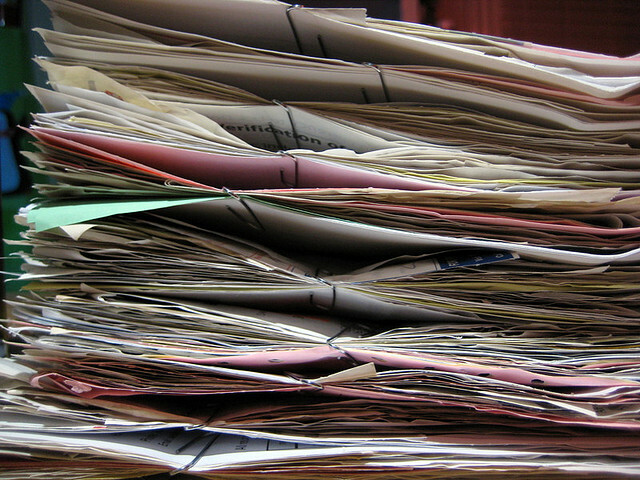 Meanwhile, what are some of the insane ways you pile on the paperwork? What have you seen in other places? Comment below. Why do you need peoples DOB? 1. Our database requires a DOB for the entry of any name. Therefore, if we want to follow up with a first time guest, we have to have that in order to navigate the system. 2. General demographic info. If the database didn’t have the requirement, I’d be fine to just get a birth year or an age range (under 18, 18-24, 25-39, etc), so long as we had a general idea of who is coming.